One of the innovations that Clarity has developed, the Clarity Total Service Provider (TSP) Index, piqued our interest so much that we decided to make it a part of the 2016 MSP 501 study. Assessing the strength and vitality of a managed service provider (MSP) is no easy feat. But Clarity Channel Advisors has come up with an innovative way to put the market into perspective. In particular, it has devised an index for assessing a company’s potential for growth and efficiency. Clarity, of course, was MSPmentor’s key partner on the 2016 MSP 501 list and study. The Quincy, Mass., company not only helped with data collection and analysis, it also contributed significant thought leadership to the project. 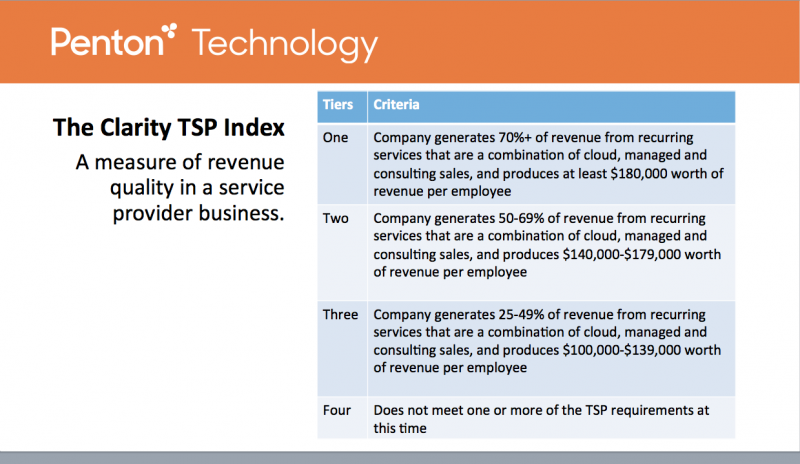 One of the innovations that Clarity has developed, the Clarity Total Service Provider (TSP) Index, piqued our interest so much that we decided to make it a part of the 2016 MSP 501 study. Every company that participated in this year’s survey, including those that did not qualify to be on the 2016 MSP 501 list, has been given a Clarity TSP Index tier score. Lippie believes that the TSP Index is especially useful for helping to determine a company’s future worth, which is important to those interested in mergers and acquisitions. One thing to note: there are strong and capable companies within all TSP Index Tiers. In fact, some of the most innovative MSP 501 companies are Tier 4 organizations. But when it comes to cloud and managed service providers leadership and productivity efficiency, some companies stand above others. Hence our keen interest in the Clarity TSP Index. Hi Guys, have you already, or will you post a list of results with geographic references in them? We would like to know how we performed when compared to other companies located in Oceania. Yes, I would be in interested in the geographic references as well. Do you plan to provide a list including geographical area? It would make this a much more valuable marketing piece if you did. Thanks. I agree too, a united list of all would be best. As a new member to this forum, how do you find the companies to put on this list, and can I search the list by company name? We’ll announce the entry period for submitting an online survey sometime in Q1 for the 2017 list. The version as published on the site is not searchable, but I’m passing your name to our folks who know more about packages that include that feature.